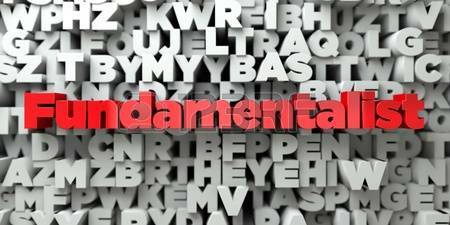 FBC Jax Watchdogs: Watchdog's Characteristics of a Religious "Fundamentalist"
Watchdog's Characteristics of a Religious "Fundamentalist"
On Facebook recently some of my friends were discussing the definition of "fundamentalism" and "legalism". I use the term "fundamentalist" quite frequently, mostly in terms of defining what I am no longer, but used to be some 10 years ago and earlier. Rather than giving a definition of religious fundamentalism, I think I can better define it by listing what the characteristics are of a fundamentalist. Most of these characteristics I think are "all or none", but I suppose a religious fundamentalist may display a subset of these. Keep in mind, most of these characteristics I could add a phrase at the end or beginning: "Without any objective evidence whatsoever....", so I will refrain from repeating that. 1. A fundamentalist believes (claims) that the single most important aspect of their life IS their religion and the practice of their religion. 2. A fundamentalist believes (claims) that their relationship with an unknown and unseeable God is the single most important "relationship" - trumping relationships with their spouse, children, parents, etc. Thankfully, almost every fundamentalists only makes this claim, and their day-to-day activities and decisions prove that they truly do not believe this. But it is a duty of every good fundamentalist to at least state this claim in some form or fashion. 3. A fundamentalist believes - no, they KNOW - their religion is the ONE religion that gives a pathway to heaven and hell, and those who are outside of their religious sect are headed to an eternity of damnation. And this they hold to with great fervor, without any doubt whatsoever, despite a lack of any objective evidence whatsoever. 4. A fundamentalist will believe their holy text, as written in English, is completely true, without any error whatsoever, and completely whole containing answers to all of life's issues - AND, they believe that anyone who doesn't agree with this tenant is not a true member of their faith community, and is therefore lost and going on to eternal damnation. This was one of the key points of the Southern Baptist conservative resurgence - and many good men were destroyed over this tenant. 5. A corollary to #3: A fundamentalist will actually worry (i.e. spend time contemplating and losing some measure of their happiness) that their loved ones who don't believe the above are going to spend all of eternity burning in an unquenchable hell-fire, and never being consumed. My fundamentalist friends will unashamedly say "Why, yes, numbers 1 through 5 ARE what I believe; you mean YOU don't???" And thus, there is no way I could be a "real" Christian and not agree with #1 through #5 above. But, I am not an atheist. I am a Christian. And I maintain that my views on #1 through #5 are none of your business - maybe I do, maybe I don't believe some or all. But I am a Christian. Period. But sadly, to fundamentalists, that is not good enough. To not give assent to all five statements makes me not a true believer, and I'm headed to the lake of fire. Forever and ever, never to be consumed or extinguished. Crap. The journey out of fundamentalism for me is one that would take many chapters to explain, so I won't do that here. I'll just say I thank God - yes, I thank God - that I am no longer a fundamentalist. Oh, and what is legalism? I'm not sure, I would have to leave that up to the fundamentalists to determine. Number 2 punches a bunch of my buttons. First, anybody who thinks that pleasing an Invisible Friend is more important than their wedding vows isn't actually married at all. And, second, most people have too much sense and decency to be 'good' Christians; it's the ones who don't that you need to watch. The devout will deny it till they're blue in the face, but I suspect a lot of this stuff are really just shibboleths, things you have to say to signal membership in the club. The older I get the more disappointed I am with the SBC. I grew up SBC, attended SWBTS in Ft Worth. I was there during the " purge".....I saw good men destroyed because they were intellectuals. I saw Godly men destroyed because they did not fit the " mold." One day when the leadership of the SBC stands before Christ he is going to say to them, " I never knew you." Dog, I'm not sure why you think #2 is something confined to those you label "fundamentalists." I will confess ignorance as to other religions, but as to Chrsitianity, pretty much ALL Christians - "fundamentalist" or not - profess that their relationship to God is the most important relationship of their lives. It's one of the core indispensable tenets of the Christian faith. If you can, point me to any Christian denomination anywhere out there that is teaching otherwise. I don't think you can. Even the so-called "mainline" Protestant denominations - the ones generally considered to be the opposite of "fundamentalist" - profess this belief without reservation. I haven't researched, but it's probably even in some of their statements of belief. Which brings me to wonder, if you don't believe this (and the way you wrote it, I don't see how you possibly could), then I'm not sure how you can accurately profess to be a "Christian." I'm not being "judgmental", I'm just pointing out that to reject this principle is to reject an indispensable, universally-recognized requirement of the Christian faith. You can still say that what you believe is "Christianity", the same way that I can slap a slice of baloney between two pieces of bread and call it "gourmet cooking", but that don't make it so. Thanks for your questions, they are very good ones. Here's what I'm saying. I'm being very pragmatic and common sense. How can a "relationship" - as we define relationships as human beings - with an invisible God, be more important than relationships with humans? In fact, how can they even be compared? I have a wife and kids. I see them. They talk to me, I talk to them. We have experiences together, we see the same things, enjoy the same things, sometimes we disagree or fight. THAT is a "relationship". So it is just complete hogwash for a Christian to claim that their "relationship" to God or Jesus is more important than to other humans. Furthermore - a person can make the claim that their relationship to God is most important - but their actions make them out to be liars. They might bow their heads and close their eyes and in their minds "talk" to God, but this is for minutes during the day. A person's work, his/her schooling, his/her relationship with teachers, bosses, kids, spouses, ALL OF THEM - are more important and significant to the person who CLAIMS that their relationship to God is most important. So I am a Christian - just an honest one. A new commandment I give unto thee that you love one another. Jesus wanted us to have a relationship with each other. Interesting. Your views on these criteria are none of the readers' business, yet, you're making it your business to passively aggressively condemn those who hold to these views. Double-standard much? Ludie, I'm not condemning those who hold the views. My point is that unfortunately many that hold theses views are intolerant to those that do not. 1. Fundamentalism is not restricted to religions. People with obsessions about certain lifestyle practices gained from being "born again" are equally cultishly intolerant. Think born-again non-smokers. Some of them, there's no easy way to say this, are fascists. 2. Toleration requires me to accept that other people will have beliefs that I find to be a mixture of bizarre, unsupported by evidence or governmentally and socially dangerous. However, I am not obliged to stay silent when people spout total nonsense, and I am not going to remain silent when some of those people espouse the viewpoint that their beliefs oblige them to attempt to coerce others to also live by their beliefs.